vSphere web client is the principal management tool for VMware infrastructure. It is a flash based solution which is currently the only one providing functionality for configuration all features of VMware vSphere. The new HTML 5 web client is in works, but for now, not all functions are available so this client can’t be used for day-to-day tasks just yet. One of the annoying things when working in the lab might be the default timeout. 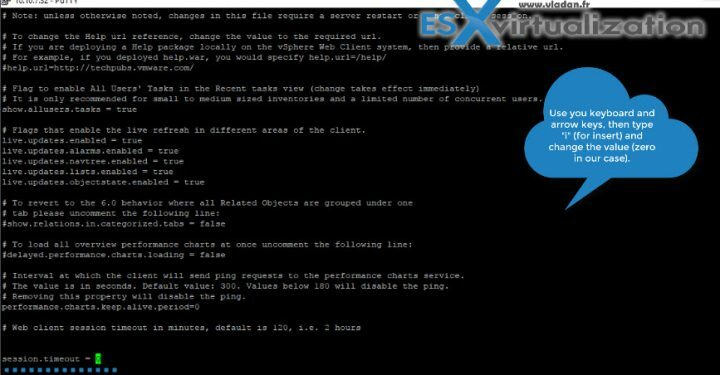 In this post, we’ll learn How To Disable vSphere Web Client Inactivity Timeout or how to modify its value. Our lab runs the VMware vCSA 6.5 latest build, and the management of the infrastructure is done through Firefox browser with Flash plugin installed. Even if one would like to set a timeout value through the GUI of the vSphere client, there is no option for that. The VAMI access to the appliance allows to configure most of the important values, but not the vSphere web client inactivity timeout. To tweak this we need to go and log in through SSH and modify one value within one configuration file. Not a big deal, but you need to know which file to modify and some basic commands for Putty SSH client. Let’s get started. Start Putty client and login to your vCSA. (Note we’re using vCSA 6.5 but this process is basically valid on older bilds too. Check the source VMware KB, I think it’s valid since vSphere 5.1. Change the value to “0” (zero). Use your keyboard and the arrow keys > press ‘i’ to insert > change the text (remove the 12 before the 0) > press ‘Esc’ > and then type ‘:wq’ to save and exit. (you can also type “:wq!” to enforce). Note that the start of the service takes some time as the service has to initialize itself. So be patient, before trying to login back into the vCSA through your web browser. If you want, you can also put a very large number, let’s say 48 hours (2880 in seconds). Here is a short video detailing the stepsCheck the video (watch full screen and HD). Then open text editor (Notepad) and edit the “webclient.properties” file. Find the session.timeout value and change it to 0 (zero) the same way as we did it above for our vCSA. Then save and close your text editor with the file. Go to Windows services (via services.msc Add-On for example) and restart the web client service. (Note: we cannot show you the screenshots because our lab runs on VMware vCSA… -:)). You may want to backup your vCSA or vCenter first? One never knows. You may or may not be comfortable by using Putty and if anything goes wrong, don’t blame us. Great tip Vladan. It is worth noting that this time out started to annoy me quite a bit since we just migrated from a windows vCenter with thick clients to VCSA6.5 that only accepts web clients. Thanks for saving me some google time! thanks for your comment. Useful indeed. Not everyone has made the move to VCSA 6.5 just yet. Does anyone know the equivalent file and setting to change on an ESXi 6.5 host’s webclient? That is, the same as this article, but instead of the timeout for VCSA’s web timeout, the same for the host’s own webclient?